The building which houses Côte in Brighton used to be the city's music library and whilst that was relocated to the new super-dooper eco book house, this old lady remained empty. When I saw it was going to become a restaurant (a chain!) I was bordering on being a bit Daily Mail about it but after a few visits (more to convince myself that each visit wasn't a fluke), I am more than happy that Côte found their home here. I walk past every day and even after a year or so, this place still is packed most evenings. I needed a bustling place that would accommodate our equally bustling friends for Mr. Graphic Foodies birthday, and Côte hit the spot. In fact I would go so far to say it has one of the best restaurant atmospheres in the city, with lofty ceilings, gold leaf, ornate cornicing, on-brand tiling and deco fixture feel. It's special yet relaxed, perfect for solo dining, couples and groups and I really do like it a lot. Embarrassingly, I have only just discovered I like scallops (thanks for the scallop linguine last week Dad - it turned me!). These pillow soft examples were served classically with pea and mint puree, pea shoots and smoky lardons. Where have you been all my life? Fresh, light and sweet. I normally order the steak here (one I ate earlier below) but I wanted to try something else. 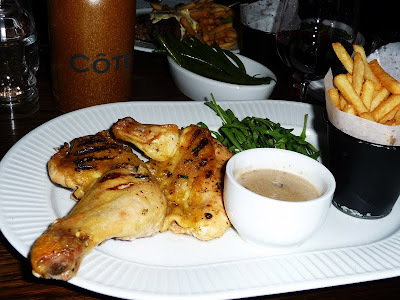 The classic French bolshie dishes on the menu all called to me; the Duck Confit, Beef Bourguignon, Prawn Gratinée... but I eventually went for the Breton chicken (a corn fed chicken from Brittany to you and me) with frites and a wild mushroom sauce. 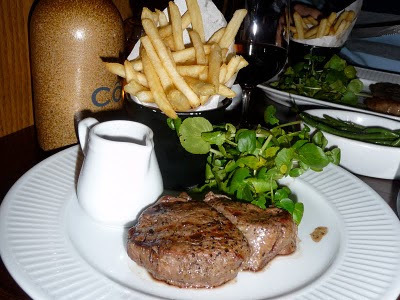 I eyed up the groaning steaks on the table and the beautiful sea bass dish one of the girls ordered which looked as good as any fish dish I have seen, but I was really pleased with my choice. Had it been just me and the husband I would have gnawed the bones clean. The woody wild mushroom sauce was perfect for dunking in the succulent flesh and the odd frite. It's simplicity but done splendidly. With such happiness round the table, I could see that people were satisfied yet impressed enough to throw caution to the wind and dive in with more wine and dessert. 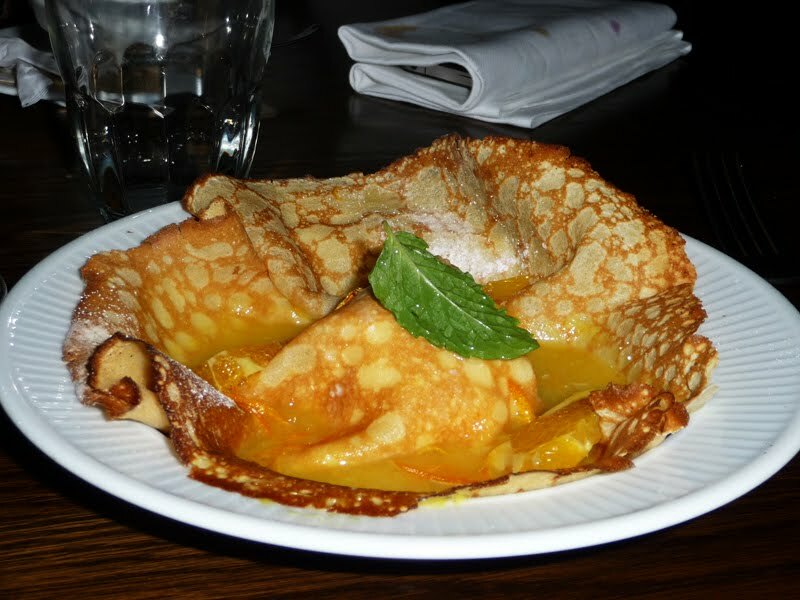 Thinking a crepe with Grand Marnier, orange segments and ice cream may be the "waffer thin" option on the menu I pipped for that. I always seem to end up with this dessert but then I am a crepe lover. Oranges, booze, ice cream... what's not to like? A perfect full stop to the meal. The various Chocolate Fondants, Tarte aux Pommes and Creme Caramels all went down a treat with the table. The touches here are great. I like the ceramic filtered water bottles put (without asking) on the table and service is incredibly efficient, smart and friendly. We were given a round of drinks on the house before the bill arrived (one of our friends cynically said it was because we'd spent too much!) but at £300 for 6 people including 3 bottles of wine, some beers, 4 or so liqueurs, 3 courses each, side orders and coffees, I think you could spend far more for far less in this city. Having eaten here quickly after work on a Monday, Friday night casual dinner or here on a packed Saturday, standards fail to slip. It's easy to be snobby about chain restaurants however big or small, but Côte is a real gem of one. From talking to friends I do think we have a particularly good and well designed branch here in Brighton, but regardless, I think it is a real dining asset to us.